Now that we’ve examined how to back up a ChessBase database, it’s time to see some of the large operations we can do with it. One very simple such operation is sorting the database directly in the game list. There are several reasons why we might want to do this. One is to arrange games in chronological order. Another is to sort games alphabetically by the name of the player of the White pieces. We can also sort games by ECO (Encyclopedia of Chess Openings) codes. Pretty much anything that appears in the game headers of our database game list can be used as a sorting criteria. Let’s see this in action. I’ve created a database of games played between the years 1830 and 1899. Since this was created as a subset of Mega Database, the games are already sorted in chronological order. But suppose we’d want the games sorted by some other criterion; how would we accomplish this? A couple of red bars are visible on the “White” header to remind us that we’ve performed a temporary sort on the database. Note that the last names of the players of the Black pieces are used as a secondary sort criterion; for example, all of Alapin’s opponents as Black appear in alphabetical order. 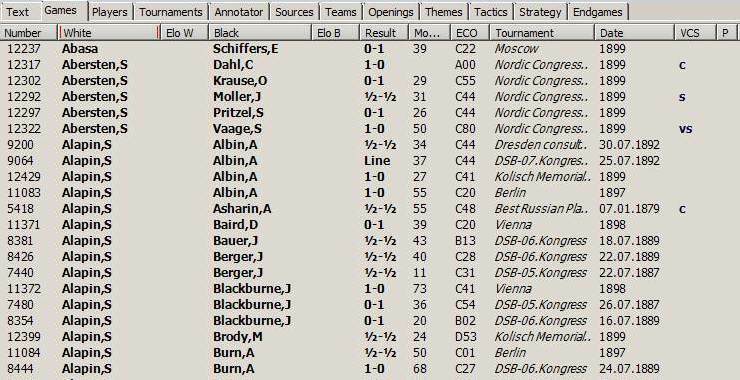 And, as before, the last names of the players of the Black pieces are used as a secondary sort criterion; all of Zytogorski’s opponents in the game list shown above are listed in reverse alphabetical order. We can do this with any of the columns which contain information. Being as this is a database of nineteenth century games and the Elo rating system wasn’t in use until circa 1970, clicking these columns won’t sort games by player ratings (as there is no information available), but will instead default to sorting the games by the last names of players of the White pieces. 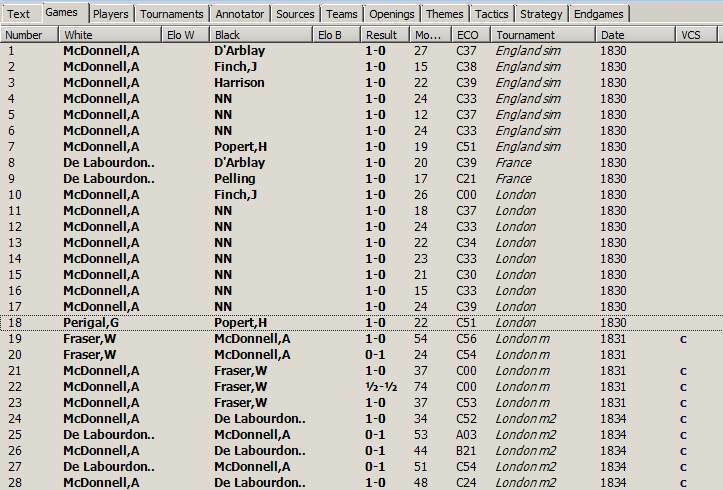 When we perform a sort by game header on a database, we also need to remember that the sort is just temporary; as soon as we exit out of ChessBase 11, the database will revert back to its original sort order the next time we launch the program and open the database. Clicking this button will display a dialogue asking us to confirm that we want to proceed with the operations. Click “OK” and, after several moments (the length of time depends on the size of the database) and a series of status updates, the game list will be re-sorted according to the new criterion. I earlier referred to this change as “permanent” because there’s no “Undo” button that allows you to go back to the previous sort order (you’d have to restore the previous version from the backup you made, which is why we discussed backups in the previous blog post). But there’s no limit to the number of times you can sort and re-sort a database. ChessBase 11, the premiere chess database software, is available now from USCFSales!